'Tis the season for short skits, tanning lotion, and graduation! Whether you have someone graduating high school or college, we need to celebrate this. School is not easy. TRUST ME! It's taken a lot for me to get to this day and I'm damn proud of it. All of you 2017 graduates should be too. If you are graduation party hopping this weekend and you need to find the PERFECT Grad Gift, then let me help you out. 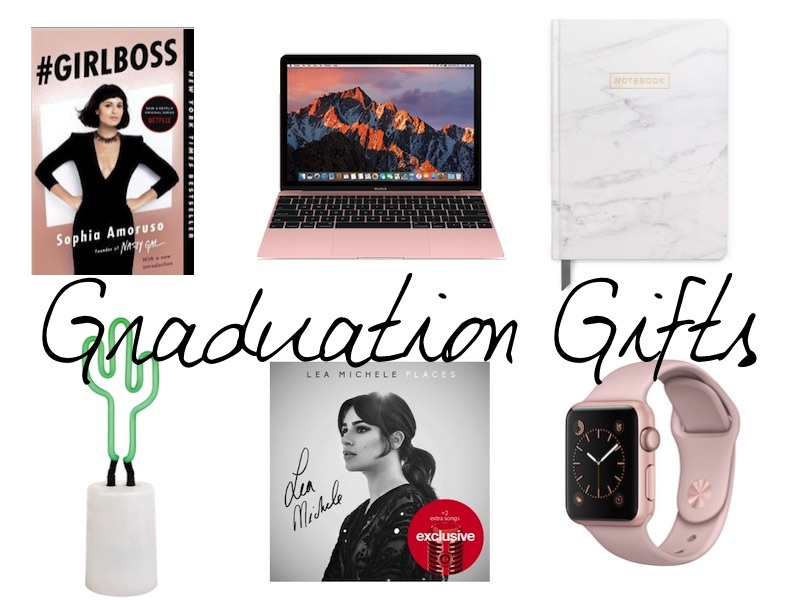 Of course, all of these items depends on how close you are and what your budget is, but there are graduation inspired gifts from $5-$5,000. Something for everyone on your list. One. Electronics // Again, this totally depends on what you're budget is, but I can guarantee you that your graduate is in need of some major upgrades. Everyday I wonder if this is the day that my MacBook is going to die on me, because it's over six years old and runs like a dinosaur. Laptops, tablets, portable chargers, headphones, even Apple Watches would be a great gift for any graduate. Two. Specialized Jewelry // I put the word specialized in there because you can get someone a piece of jewelry any day of the year. Take this special moment to get something custom made to celebrate their accomplishment. I personally love my rose gold bar necklace from Shop Lindsey Vee. You can even use the code FELINE15 for 15% off! Three. New Home Items // Usually after someone graduates, they will move. If this aspect falls under your graduate, then decor pieces, furniture, or even an Ikea gift card would help them out greatly! Just make sure it's something they actually want and will fit in their new home. Four. Books & Albums // There is a whole list of inspiring books that I would love to read! Since I just got done finishing Girl Boss on Netflix I would love to read #Girlboss by Sophia Amoruso. I would also love to get my hands on Almost Adulting by Arden Rose, The Princess Diarest by Carrie Fisher, and Make Your Mind Up by Bethany Mota. Now I put albums on this list too, because music can inspire and motivate people even if they realize it. I can totally see Lea Michele's new album PLACES being the soundtrack to the new chapter in my life. As well as the Girl Boss Soundtrack, because that one song in the final few episodes is so catchy!! Five. Gift Baskets // Even if you can't afford big pieces for your graduate, you can still put something meaningful together. Target is my favorite place to pick up a few items and put a bow on it! For less than $50 you can put together a really great grad gift. Cash always works too! If you're still looking for inspiration on what to wear to graduation check out my last blog post! Congrats to the class of 2017!